West Virginia has not flagged; according to Gallup, his average job approval rating in the state during 2017 was 61 percent — again, the highest in the country. So despite Manchin’s popularity in the state (his job approval ratio as of the end of 2017, according to Morning Consult, was 52/36), he attracted two A-list Republican opponents: U.S. Representative Evan Jenkins, who represents coal country’s Third Congressional District, and Attorney General Pat Morrisey. But as a May 8 primary approaches, it’s a third candidate who has all the momentum and is seriously worrying Republicans: former mine owner Dan Blankenship. A prominent figure in West Virginia economic and political life for years, Blankenship gained national notoriety during his prosecution by the Justice Department for his alleged role in a 2010 mine explosion in West Virginia that killed 29 workers. He was acquitted of the felony charges the Feds wanted, but was convicted on a misdemeanor charge of conspiring to violate federal mine safety standards, and served a year in a federal prison in California. 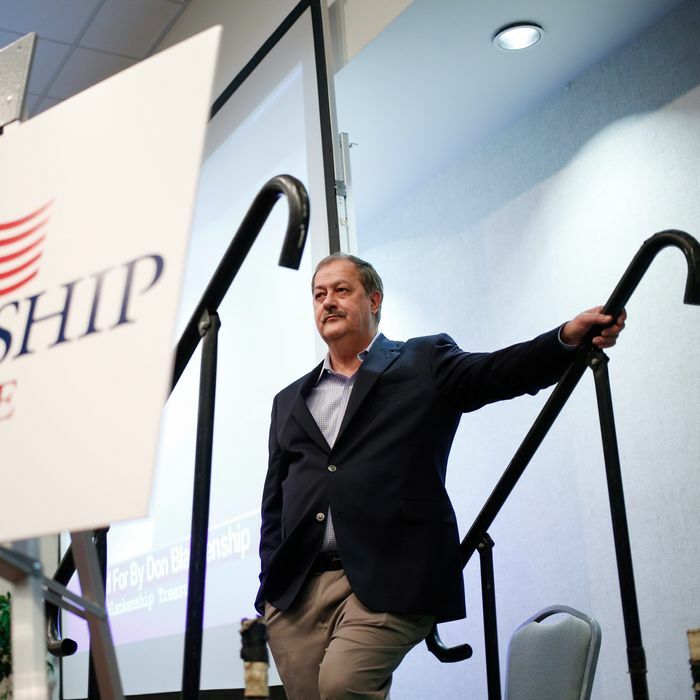 Blankenship’s rise has been driven in part by his self-financed TV ads. Since launching his campaign in late November, Blankenship has spent over $1.1 million on roughly a dozen commercials, according to media buying totals, far surpassing his opponents. Morrisey has so far spent nothing on TV ads and Jenkins only about $38,000. Blankenship has used the ads to paint his rivals as insufficiently conservative, blasting Jenkins over his positions on Obamacare and climate change, and Morrisey on abortion. He’s positioned himself as an unshakable ally of President Donald Trump, who received 68 percent of the vote in the state. Jenkins is somewhat vulnerable as a former longtime Democratic state legislator who only became a Republican in 2013 when he decided to run for Congress. And Blankenship has gone after Morrisey for his law firm’s links to pharmaceutical companies, and his wife’s law firm’s representation of Planned Parenthood. Objective public polls in this contest are hard to come by, but the consensus is that the race has become a close three-way fight. A new Morrisey-commissioned poll shows Jenkins dropping into third place behind Blankenship, who is right behind Morrisey. A Manchin–Blankenship general election would be nasty and personal. The senator has said of the mine owner: “I believe Don has blood on his hands.” And Blankenship has charged that Manchin, who was governor at the time of the mine explosion, conspired with Barack Obama (not a popular figure in West Virginia) to send him to the hoosegow. National Republicans understandably fear that this kind of grudge match would move a key Senate race away from the partisan and ideological issues where they have a big advantage in West Virginia. And even if Blankenship fades before May 8, he’s doing some damage to the other two candidates. West Virginians seem split over Blankenship’s culpability in the death of the miners; their tendency to forgive him reflects the ancient dependence of the state on vanishing coal jobs and their defensiveness about federal efforts to regulate the industry. But if Blankenship makes it through the GOP primary, voters will have to come to grips with his decidedly mixed legacy, and his stretch in the slammer.